Posted by Karen at 6:22 p.m. I remember these! 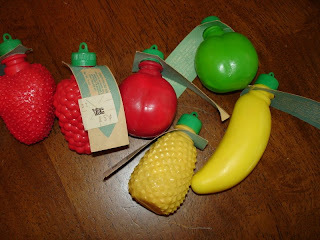 In fact this summer I found some at "Party America" and we bought them as party favors for a luau themed party. They don't taste as good as you remember - unless you still like to eat straight sugar, then yes, they're still delicious. My 2 year old nieces LOVE them though, and want them every time they come over, so the tradition continues!